My daughter is a 10 year old basketball player. Earlier this year, she heard about the amazing UCONN women's team and began watching them play on TV. She went to the UCONN women's basketball website to learn the names and heights of all of the players. At 4' 7' in 4th grade, she is worried that she will not be tall enough to play for UCONN. She was comforted to learn that there are some shorter girls playing for the team. Lorin Dixon is listed at 5' 4" and Bria Hartley is listed at 5' 7". Both of these UCONN players are shorter than the tallest girl (5' 9") on her 4th AAU team. This past weekend, I took my daughter to see the UCONN girls play live versus in Cincinnati. My daughter could not wait to see Maya Moore (the best women's NCAA basketball player) and Tiffany Hayes in action up close. Neither disappointed. Maya scored 23 points and had 5 rebounds and 6 assists. Tiffany Hayes scored 16 with 5 rebounds and 5 assists. My daughter was grinning from ear to ear during the game as UCONN beat the University of Cincinnati by 35 points. After the game, as we were driving from the stadium to the gym where she would play her games, my daughter CC reconfirmed that she wants to go to UCONN to play basketball. CC's 4th Grade AAU team ran into some very tough 5th graders in game one and lost big. Then they played a 6th grade team. They lost that game too but it was a close game. The coach plays older teams to prepare the team for the AAU championships. CC was the smallest on the court. During the 6th grade game, CC was run over by a 6th grade girl as she was trying to complete a fastbreak. CC was lucky that her elbow did not get a fast break. 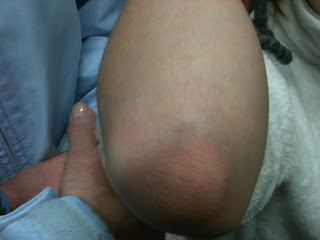 It turned black and blue and swollen, but she is ok. Undeterred and unintimidated, she went back into the game to play. She will have to be tough to play for UCONN. Those women play a very tough brand of basketball. Let your kids dream big. Help them understand what it takes to get to the top. Dreaming big and working hard to make dreams happen will benefit my daughter even if she never suits up for UCONN. Sports mom, JBMThinks, illustrated just how hard it is to earn a roster spot on a Division 1 college sport team in a recent post. Only 3% for HS basketball players will earn that distinction. Parents have the power to help children expand their world through their dreams.